On Monday September 17, Governor Jerry Brown signed Education Trailer Bill AB1840.We put together a quick video explaining the bill—check it out and read the details below. The headline for this bill is that the state will be providing OUSD with $30 million over three years to help spread out the pain of the district cutting that entire amount all at once. This money is not a loan, but does come with the expectation that OUSD will continue making improvements on overall budgeting and not need more relief in the future. How will the $30 million be spread out over three years? 75% of OUSD’s operating deficit for 2019-20. 50% of OUSD’s operating deficit for 2020-21. 25% of OUSD’s operating deficit for 2021-22. The good news is that $30 million would have been devastating for the system and now will be spread out. The bad news is that $30 million over three years is still going to be very painful throughout the entire system and felt from the boardroom down to the classroom. Like with most bills, there are some gray areas. One important question to answer is who exactly determines OUSD’s operating deficit? The bill references a partnership between three entities in working out the details of the relief and reporting to the state. OUSD will obviously be a key player in reporting their finances and sharing their projected deficit. FCMAT is an independent organization that partners with districts and county teams to provide fiscal advice and management assistance. 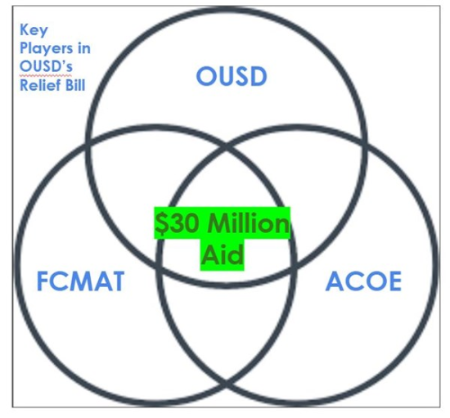 It should be noted that in the last two years, FCMAT has completed two reports on OUSD’s fiscal challenges. One report presented directly to OUSD and the other report was written for Alameda County Office of Education. Alameda County Office of Education will play the role of approving OUSD’s annual district plan, and certifying OUSD’s budget. The short answer is yes. The long answer is that the specific list of expectations and the determination of whether or not those expectations are met will be an interesting interplay between OUSD, FCMAT and ACOE. 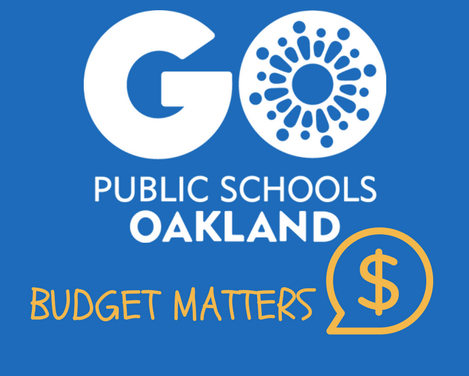 The most important thing is that OUSD continue prioritizing fiscal vitality throughout the organization, and demonstrating a commitment to making significant budget reductions. OUSD has shared some specific expectations they are likely expected to meet, including exploring the sale or lease of property to increase revenue and continuing to consolidate the number of schools in OUSD. GO will continue following AB 1840, and sharing updates on OUSD’s progress towards fiscal vitality, budget cuts for 19-20 and opportunities for community to engage with district leaders about the difficult decisions ahead. Follow GO Public Schools Oakland on Facebook, Twitter and Instagram and share our pages with friends and colleagues. Reach out to me (ntahai@gopublicschools.org) to come and present to your school community about some of the root causes of OUSD’s current financial challenges and updates on how to get involved. Attend an upcoming OUSD Special Committee Meeting on Fiscal Vitality.